The alarm on my phone rang at 5:30am and I immediately reached over to turn it off. It turns out I had already been up for a few hours. It would take a few extra days for my sleep schedule to get on track, initially my internal clock was somewhere in Eastern Europe rather than Ireland. We called a cab and headed for the tourist office. Our walk the previous night had proved that unless we wanted to start walking around five in the morning, a cab was needed to get to the tour departure point. Our cabby wasn’t very talkative, he just drove us and overcharged for the trip but I was too tired to realize it at the time. As we climb out of the cab we look around and realize… there aren’t many people there. We were early. As it turns out, I had confused departure times for the tour so we had arrived at the pickup spot roughly an hour early. Oops. Sorry honey. The Dublin Tourism Office is the pickup spot for a number of tours by various companies to a number of different destinations around Ireland. Eventually our bus rolled up and the driver popped out to proclaim “Extreme Ireland! Cliffs of Moher!” And so we got on the bus, excited for our day. Once the bus was loaded he closed the tour bus door and off we went. Lots of people were dozing so Mike, our tour guide, didn’t talk a great deal but he did some initial introductions before winding down and letting people doze during these wee hours of the day. “I’m Mike Murphy, some people think that’s a fake name but it isn’t. It’s really mine.” Mike seemed to be in his late thirties and over the course of the day shared many stories with us. He grew up in Wexford, or “Wexico,” as apparently it is jokingly referred to. He comes from a family of farmers and he grew up working the farm as the youngest of a large Irish family. Mike was fun tour guide but he did have a habit of telling a joke and then telling it again a few minutes later. I’m not sure whether it was part of his charming host personality or if he genuinely forgot he had already told the joke but it was something I remembered. The tour was an all day thing, we got on the road around 7 a.m. and didn’t return to Dublin until 8 p.m. The bus took us across Ireland the country to the west coast. Along the way we stopped a few times, first was just at a gas station which had some food options and was a chance to stretch our legs. Next was a stretch and sightseeing stop in Limerick. 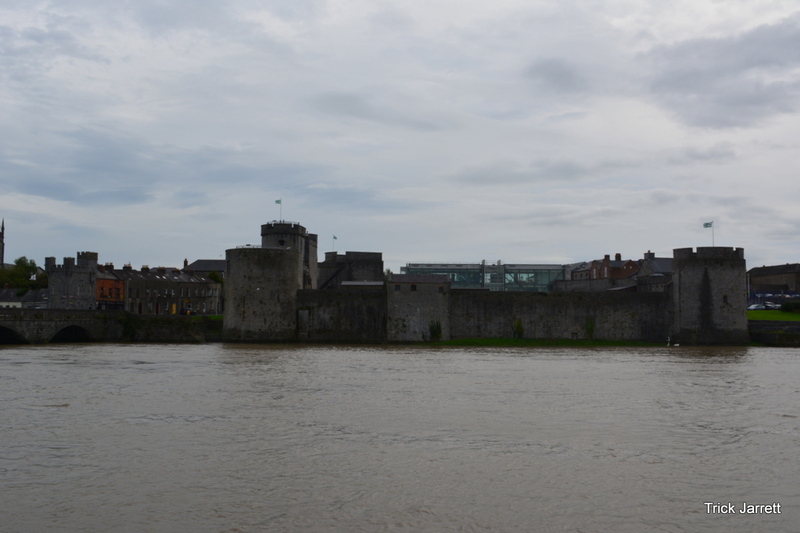 During the short stop in Limerick we saw King John’s castle from across the river, but we didn’t get close to it. After that, it was time for the Cliffs. Words can’t do the the Cliffs justice. 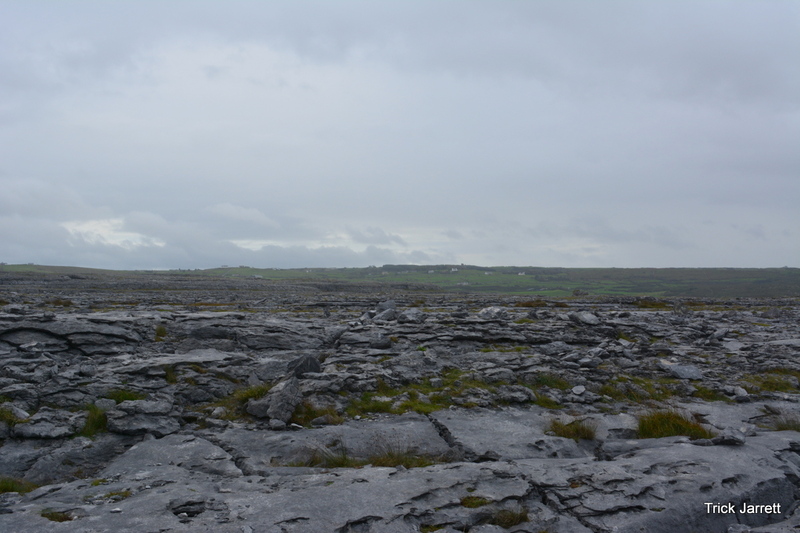 As it turns out, the Cliffs aren’t the highest cliffs in Ireland, those are elsewhere. 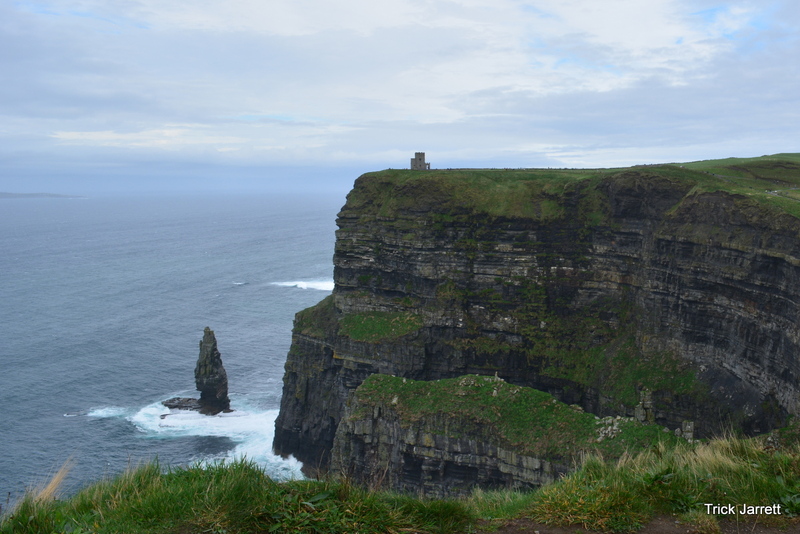 The Cliffs of Moher are the longest high cliffs in Ireland, they run nearly 8km which is what leads to the spectacular vistas such as the top photo on this post. I walked a fair ways along the Cliffs while Katie opted to stay back and not keep going. There is a walking path which extends beyond the official Cliffs of Moher site. When you reach the end of the official area they make it very clear that it is dangerous due to the winds on the cliffs, people die every year because they are stupid. 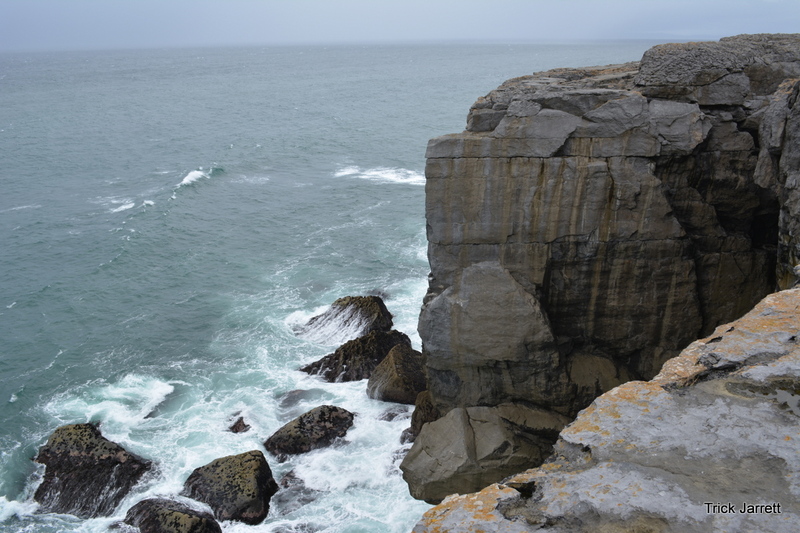 I ventured as near the cliff’s edge as I dared, roughly a foot or so from the edge trying to get some awesome photos. Disclaimer: I’m an amateur photographer using a professional grade camera. I did the best I could. Eventually, I turned back to go find Katie before it was time for the tour to depart to grab lunch. Up to then the weather had really held out. 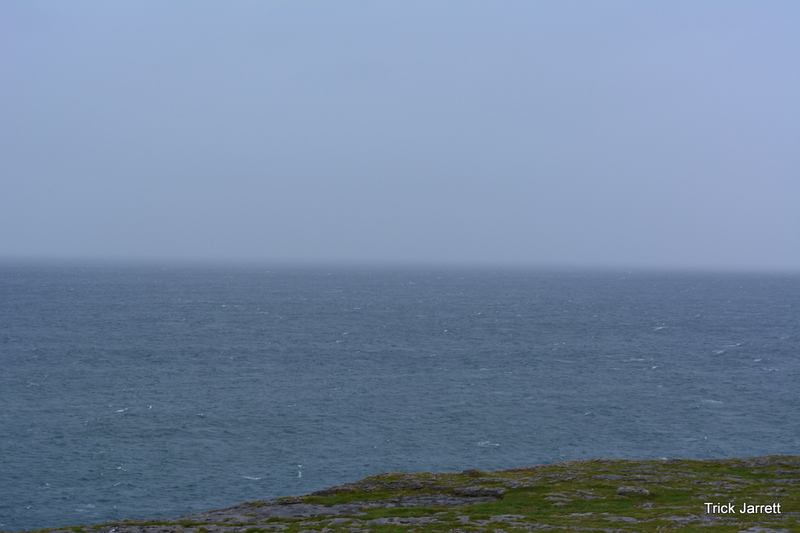 As it turns out we were treated to some fairly wonderful weather during our time in Ireland, while on the chilly side it was far from unpleasant and, for the most part, the rain held off. We ate at a brasserie style pub where I ordered my requisite Guinness and enjoyed a true Irish meal. Let’s talk for a moment about me and beer. I am, on the whole, not a beer fan. I believe I have an allergy to beer, my throat feels like it closes up after just one or two drinks. It’s not like I have trouble breathing, but between not really liking the taste and that feeling in my throat – I’m not exactly driven to drink beer. Normally when I do try to drink beerh, I stay far away from dark beers, so Guinness is quite an unusual drink for me. Perhaps my allergy would abate if I drank more beer but I’m not planning to work on it with any great vigor, I’ll keep to my Scotch which affects me far less. Except while in Ireland, where I felt obligated to order a pint of Guinness. As it turned out, I was able to get about three quarters through it before calling it quits. I’ll consider that a win. After lunch, while everyone else was finishing eating, I snapped a few photos from the town outside before we loaded up again. Our next stop was to visit a unique piece of terrain called a karst. Karsts form by the dissolution of stone by water. 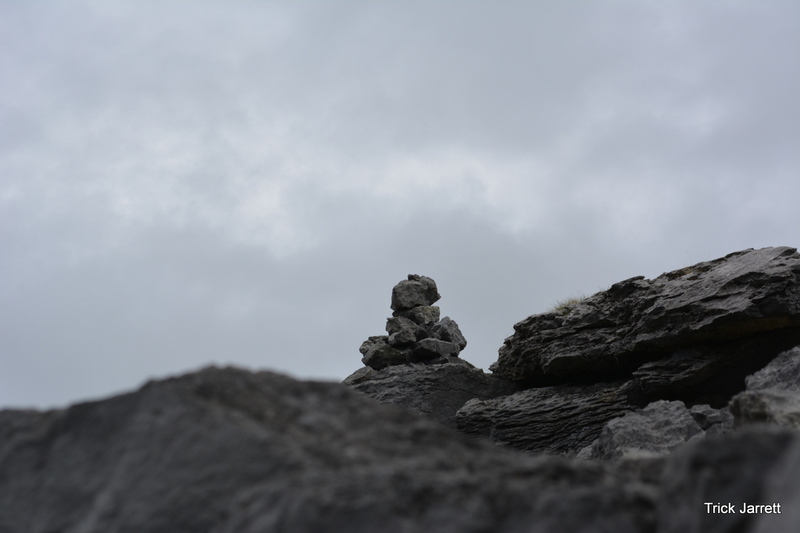 It was just as we began approaching the karst that the weather changed and the rain clouds rolled in. At the moment the doors opened it was dry but there was no telling how long it would last, so I raced off to snap pictures. Apparently the day before a fisherman was swept out to sea at the karst. The Irish Coast Guard were there monitoring and I assume watching for any sign of him. I was up on the karst plateau snapping photos when I looked out to the water and realized that the rain was getting very close to us. So I began snapping photos like a mad man before dashing for the bus. 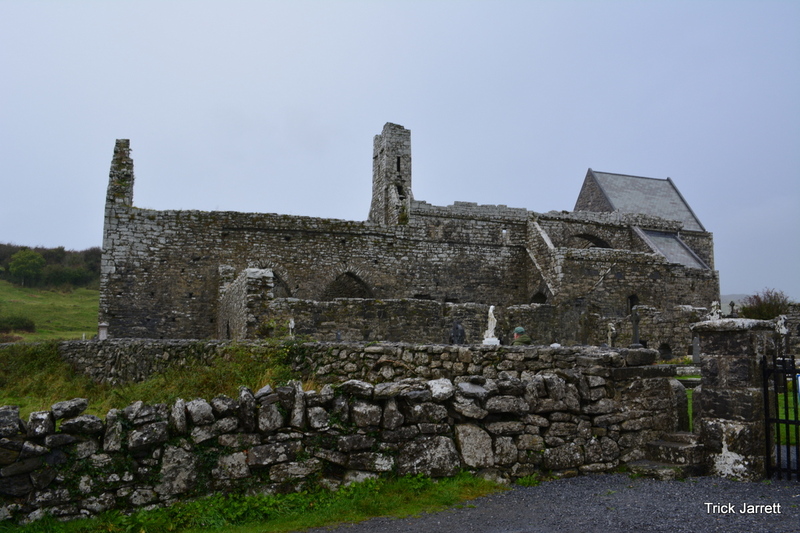 Once we rolled away from the karst we visited the Corcomroe Abbey. It was built in 1182. 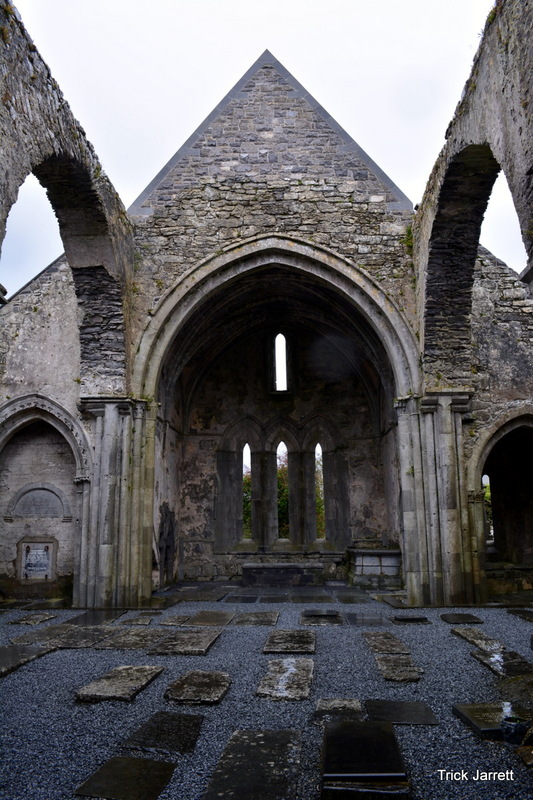 The abbey was commissioned by the Irish King Conor nu Siudane Ua Brian, who is also buried there. Legend goes that he executed the five masons who built the abbey to prevent them from creating a competing masterpiece. The above photo is one of my favorite from this trip. I had run ahead of the tour group so I could get into the area before the others and was able to get this wonderful shot. After we visited the abbey it was time to turn back and begin the ride home. We all settled back into the bus for the long ride, pretty much the entire bus dozing off during the ride at one point or another. We had a great time on the tour, once we got back to Dublin we grabbed a cab back to the hotel, ordered dinner, and settled in for the night. 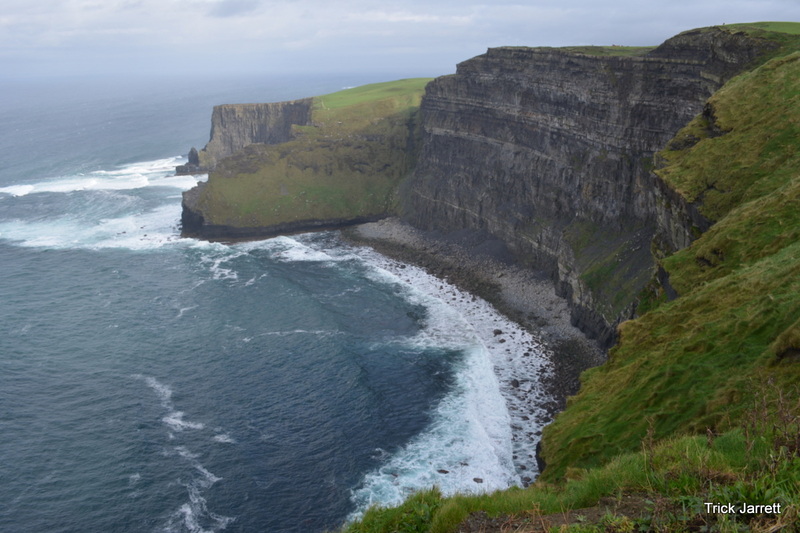 Something that I never really considered, and eventually learned, is the fact that there are people in Ireland who have lived there their whole lives and who have never seen the Cliffs of Moher, or the Giant’s Causeway for that matter. It is silly but I had assumed it was just one of those things that everyone in Ireland would have seen. But as I thought about it I realized it’s like anything else – there were major landmarks in Florida I never saw despite living there the vast majority of my life. 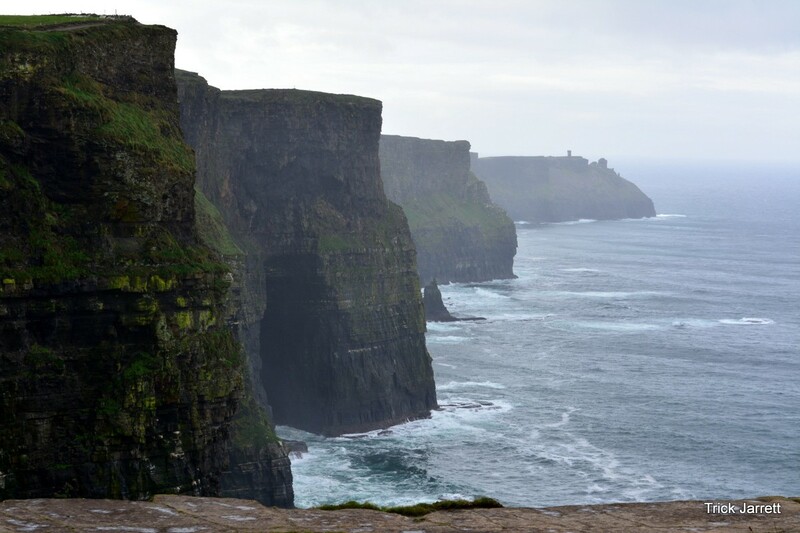 I am so thankful to have seen those cliffs, and barring them falling into the sea – I will eagerly look forward to seeing them again in my next visit to Ireland. Next time: I talk about getting sick in Ireland and the Giant’s Causeway.